Description: TECNALIA Research & Innovation is the first private Research, Development and Innovation (R&D&I) organization in Spain and one of the leading ones in Europe, with a staff of 1500 experts (including 192 Doctors), 22 headquarters and a turnover of 120 million Euro. The mission of TECNALIA is to transform knowledge into GDP, improving people’s quality of life by generating business opportunities for companies. To accomplish this, TECNALIA is organised in 7 interconnected sectorial Divisions: Energy and Environment Division, Sustainable Construction Division, Industry and Transport Division, ICT – European Software Institute Division, Innovation Strategies Division, Health Division, and Technological Services Division. TECNALIA’s offer includes different activities: technological services, testing and certification, R&D&I projects, transfer of industrial property, business promotion, business diversification, innovation management and foreign support. Description: The core of THOR Laboratory is a 4-quadrant fully programmable voltage source in the power and voltage ranges of up to 1.25 MW and 3300 V respectively. Frequency variations of the output voltage from 0 to 75 Hz as well as generation of programmable sets of voltage harmonic components up to the 10th harmonic are possible. The flexible grid can be used as a grid emulator to test power converters. Possible equipment for tests are: Wind converters, energy storage converters, traction converters and grid power quality devices like STATCOMS, FACTS or active filters. A SCADA system controls the labs’ parameters. Description: Coupled to the 30 kV radial network, the microgrid formed by different generation, storage devices, loads, with a manageable power of 200 kVA. The facility deals with the connection, integration and validation of technologies related to DER including EV, as well as with the operation and control strategies of the entire microgrid. Description: - 1120 Ah battery bank (24 Vdc): single-phase coupling using one Xantrex SW 3024 inverter. - 1925 Ah battery bank (48 Vdc): three-phase coupling using three Xantrex SW 3048 inverters. Description: Different rectifier-based DC sources, AC/AC converters, power electronic devices for network quality improvement (DGFACTS), 4Q full converters, etc. Description: The diesel generator units consists of a diesel motor (John Deere – 55 kW) and a three phase synchronous generator (400V, 50 Hz, 63 kVA). The controllable rectifier accepts a 380 Vac 3-phase voltage and provides a external-controllable (4-20 mA) output from 540 Vcc to 780 Vcc 100 A maximum. Description: PEM-type Ballard Fuel Cell, Nexa model, with 1.2 kW nominal power. As the FC supplies an unregulated voltage output, it comes together with a DC/DC converter and it does include algorithms for battery charge control. This device is normally used connected to the 1.5 DC load. Description: The EG system is made up of two main parts, the turbine generator and the AC-AC converter: The turbine is supplied with liquid fuel (gas-oil) and rotates at up to 60.000 rpm. The generator´s output is a 380 Vac 400 Hz 3-phase voltage which represents the input of the subsequent stage of the AC-AC converter. The AC-AC converter generates a delta 480 Vac 60 Hz or star 380 Vac 50 Hz. Description: Two parallel connected 3-phase simulators provide voltage 228/132 Vac up to 500Hz creating an AC voltage and frequency reference for testing purposes, one controllable DC voltage network generated through rectifier and inverter. Description: The single-phase 0.6 kW pthotovoltaic installation is based on 13 UF42 modules (amorphous structure) and a SunnyBoy 700 Inverter. The other single-phase 1.6 kW pthotovoltaic installation is based on 16 Isofoton I-106CR modules (mono-crystalline structure) and a Xantrex SW 3024 Inverter. The three-phase 3.6 kW photovoltaic installation is based on 24 BP SX 150 S modules (multi-crystalline structure) and three SunnyBoy 1100 Inverters. Description: One configurable line simulator being possible to adjust the magnitude and angle of the circuit that is supposed to be connecting the generation and the consumption. The simulator has capability of different impedances selection. Description: 5 kW ultracapacitor-based UPS designed by EPRI PEAC Corporation. The 48V DC link of the UPS is connected to a bank of eight ultracapacitor modules. Each module is rated at 4500 F and is able to store 360 kJ of energy. This system is able to support the full load for about 6,5 minutes. Description: Wind turbine with a nominal power of 6 kW equipped with a three blades rotor (4 m), automatic brake system by tilt up and neodymium magnet alternator. Description: The lab includes techniques for : Substrate, cell and encapsulant chemical composition, microstructural morphology and optical properties characterisation. The instrumentation comprises SEM-EDS, AFM, XPS, FTIR, Raman and UV-Vis spectroscopy; Equipments for adhesion, hardness and scratch resistance of the encapsulation system; Equipments for gloss and colour change measurements of the modules; An equipment and test procedure specifically developed for wind particle abrasion testing. - Equipments for accelerated lab tests include chambers for UV aging chamber, temperature and humidity cycling, and salt spray. Description: Conformity Assessment and Certification Services of Electrical Equipment for T&D networks and industrial applications, to certify compliance with national and international standards, regulations and technical specifications from utilities and manufacturers. The 5000m² area lab is in operation since 1991 and covers a range of 300 MVA. It is run by 39 employees. Description: The semi-anechoic chamber is the main facility for EMC tests in TECNALIA. It has the following inner dimensions: 8.4 x 4.9 x 5.4 m (height). Walls and ceiling are covered by a double absorbing system: ferrite tiles and polyurethane foam absorbers. The chamber is used for radiated emission measurements from 10 kHz to 12 GHz and for radiated immunity tests in the range of 80-3000 MHz. Equipments to be tested are placed in a 2m diameter rotatory platform, which is designed for supporting more than 500 kg. Usual distance between equipment under test and antenna is 3 m. TECNALIA is accredited by ENAC (the Spanish member of EA, ILAC and IAF) for the most employed European EMC standards and it is a Notified Body under the 2004/108/CE Directive (European EMC Directive). Description: The key research and testing activities of this laboratory are: advanced power system architectures, microgrids for buildings and districts, new power converters for grid connection, smart metering and grid automation, electric mobility (infrastructure, V2G), demand side management and demand response. The Laboratory consists basically on a set of interconnected testing and research platforms, most of them already in operation: - Electrical equipment testing platform (includes high power lab and MV&LV lab) - Microgrid and Distributed Energy Resources (DER) testing platform - Energy storage platform - Smart grids communication platform - Renewable energy testing platform - Electric Vehicle testing platform - Power electronics and energy conversion platform INGRID – TECNALIA Smart Grids Lab, is an accredited laboratory according to EN ISO/IEC 17025 and a member among others of IEC/TC57 (“Power systems management and associated information exchange”), CENELEC/TC210 (“EMC”), Group of Notified Bodies under the EMC Directive (ECANB), and many Technical Committees of AENOR (Spanish Association for Standardization and Certification). Description: TECNALIA has an advanced platform forcharacterising, developing and validatingmechanical and electrical components whichcan be combined with high performanceelectric vehicles. TECNALIA especially focuseson EV integration within the smartgrid, BMSdevelopment, test benches, business modelsanalysis, fast charge and other advanced powerelectronics based systems. Further fields of researchinclude tele-management as well as data collectionsystems (EVSE, EVSP, DSO). 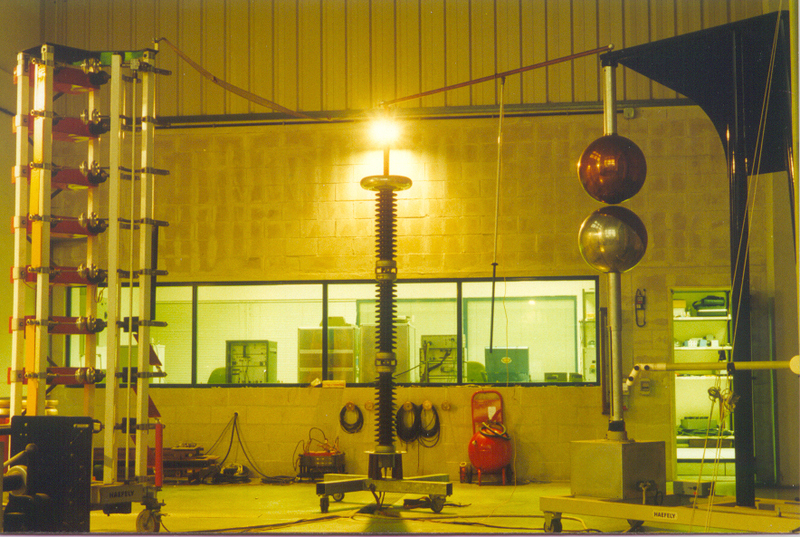 For wireless chargingTECNALIA has developed a system based on aresonant magnetic coupling, able to charge an EVat 3.3 kW with a performance above 93%.TECNALIA complements the research withaccredited testing capabilities to measure andassess the compliance of products with Standardsand Regulation. TECNALIA already offersservices for assessing compliance for EV and theircharging infrastructure: Low Voltage and EMCDirectives; 61851: Charging Systems for EVs;IEC 15118: EV communication interface and EN61439-7 Low-voltage switchgear, and control gearassemblies. Description: System for algorithms development and simulation of electric vehicles connected to the electricity network, based on a bi-directional 4 kW Xantrex inverter, 2.64 kWh battery storage, a grid analyzer, a power meter, and PLC/GPRS communications. Description: KUBIK is an international outstanding and unique experimental facility for R&D that provides a real live test bed for building technologies, specially focused on energy uses, aiming for the development of new concepts, products and services to improve energy efficiency in buildings. The main characteristic of KUBIK is the capability to build realistic scenarios (residential, office, schools) to analyse the energy efficiency obtained from the holistic interaction of the constructive solution for the envelope, the intelligent management of the HVAC and lighting systems and the supply from renewable energy. Description: Mobile Resonant Test System WRV 80/260 from Highvolt aimed at the commissioning tests of HV underground and submarine cables after installation. Test Frequency: 20 - 300 Hz Test Voltage: up to 260 kV Test Current: up to 80 A Cables tested: from 45 to 400 kV and up to 10-12 km long Collaboration with other labs to test longer lengths and at higher voltages, thorugh series or parallel connection of Resonant Units. Description: On-Site test laboratory for diagnosis and predictive maintenance of large Rotating Machines at power plants (thermal, nuclear, combined cycles, hydro) and Power Transformers at substations and industrial and power plants Rotating Machines: HIPOT Tests, DC Leakage Tests, resistance of windings, PI, tan delta, PDs, EL CID, capacitance mapping Power Transformers: Tan Delta and capacitance of windings and bushing, FRA, return voltage, PI, windings resistance, magnetic core characterization, voltage ratio, short-circuit impedance. Description: This infrastructure is directed to the application of available software and the development of new theoretical methods and software tools in the field of computational modeling for the optical, thermal and mechanical design of PV and BIPV modules. Description: The infrastructure is mainly focused on hybrid cell development with ordered nanostructures by in-situ polymerisation processes and lightweight and flexible/geometry adaptable encapsulation systems. Description: Support to the International Certification of PV Inverters Up to 300 kW. CE Marking: EN 50178, EMC Germany: DIN VDE 0126-1, VDE-AR-N 4105, FGW-TG Part 3 Italy: CEI 0-21 Spain: RD 1663 Other markets: EN 50438 Other standards: IEC 62116, IEEE 1547, CSA 22.2, EN 50530, IEC 61683 Voltage Dips: RD 1565/2010 The testing facilities include: LV Microgrid powered with AC and DC buses AC power supply sources: 165 kW regulable; 450 kW fixed DC power supply sources: 150 & 300 kW regulable 3 m Climatic chamber RLC loads for Q > 2.5 for 150 kW inverters in anti-islanding tests. Description: TECNALIA is an official laboratory to certificate the Spanish and Portuguese DLMS/COSEM profiles (“Companion Standards”), developing also the pre-certification testing tools for smart meter manufacturers. TECNALIA collaborates in the Meters & More Association, specifically to include the DLMS protocol in the Meters & More specification. TECNALIA participates in the Certification Task Force, writing different parts of the Test Book for Service Nodes (meters) and Base Nodes (data concentrators), selecting the official certification testing tools and being an accredited test laboratory for this type of equipment. Both PRIME and G3 comply with (ITU-T G.9955 and ITU-T G.9956) and use DLMS/COSEM protocol (IEC 62056) as the data model for the information transfer. Tests: - PRIME protocol certification - DLMS tests - Meter interoperability tests - Smart metering efficiency tests - CENELEC EN50065-1, EN50065-2-3, EN50065-7 and other EMC tests. Different laboratories certified according to ISO/IEC 17025:2005 (testing activities), ISO 9001:2008 (research activities) and ISO 14001:2004 (testing and research activities). Equipment tests of: Wind converters, energy storage converters, traction converters and grid power quality devices like STATCOMS, FACTS or active filters. IEEE Transactions on Power Electronics, February 2016, Vol. 31, nº 2. IEEE Transactions on Power Electronics, June 2017, Vol. 32, nº 6.